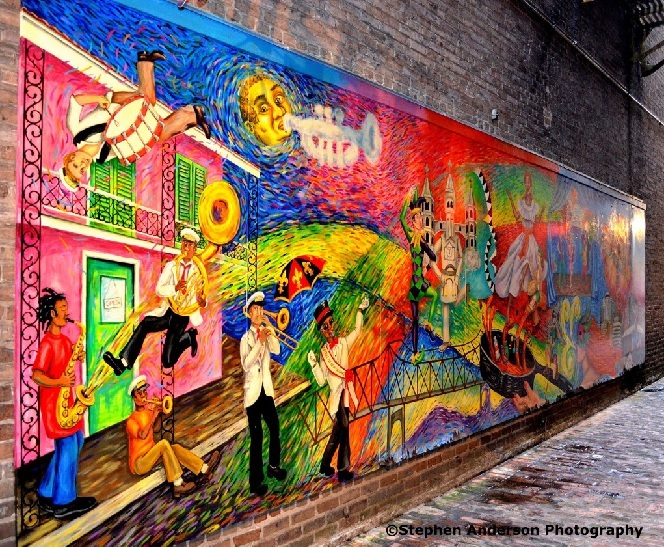 New Orleans is known for its food, as well as its music. One of its most famous dishes, “gumbo”, is known for its flavor, seasonings, combination of ingredients, varied culinary practices from several cultures and its incredible taste. Similarly, you can liken the music of New Orleans. Arguably, the greatest music city in America is New Orleans. 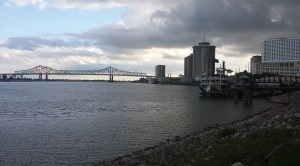 There are many other cities that could easily enter into that debate such as Detroit or Nashville, but what New Orleans has that makes it so unique in its greatness is the melting pot found there. Jazz, Blues, Zydeco, Country, Rock, Funk, R&B and other genres show their presence in a huge way in the city known as The Big Easy. The city has seen many classic venues survive floods, storms and changing times. Sadly, many are left only in our memories such as The Warehouse at 1820 Tchoupitoulas Street, where The Line’s Stephen Anderson saw some of classic rock’s premier 60’s & 70’s acts of the day perform in the Warehouse’s infancy. Conversely, just as he was there in the beginning, I was there at its final show done by Talking Heads. As stated, New Orleans’ musical history covers many, many genres including a successful Punk Rock scene in late 70’s and 80’s. One of The Line’s favorite venues in New Orleans is The House of Blues. In a city full of interesting places for music, The New Orleans’ House of Blues at 225 Decatur St, which opened in 1994, makes a nice addition to the scene. 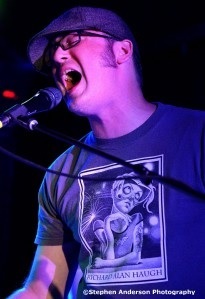 Touring acts and locals perform on a variety of stages. 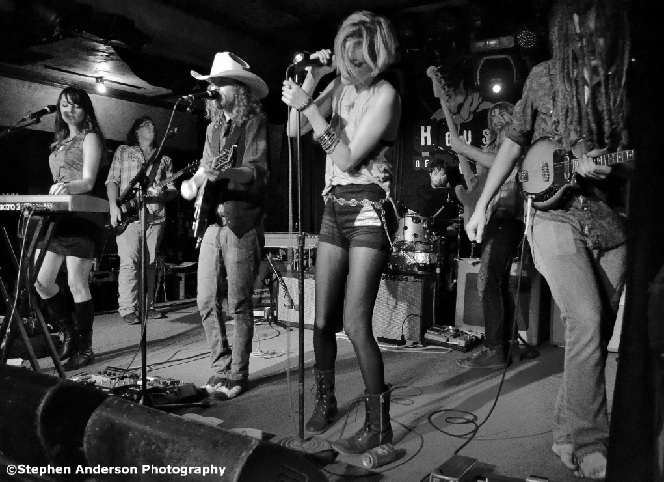 Nearly six months later, we returned to see Rosco Bandana again, but this time, joining them was another of ‘the most up and coming bands in the region, Kaboom. 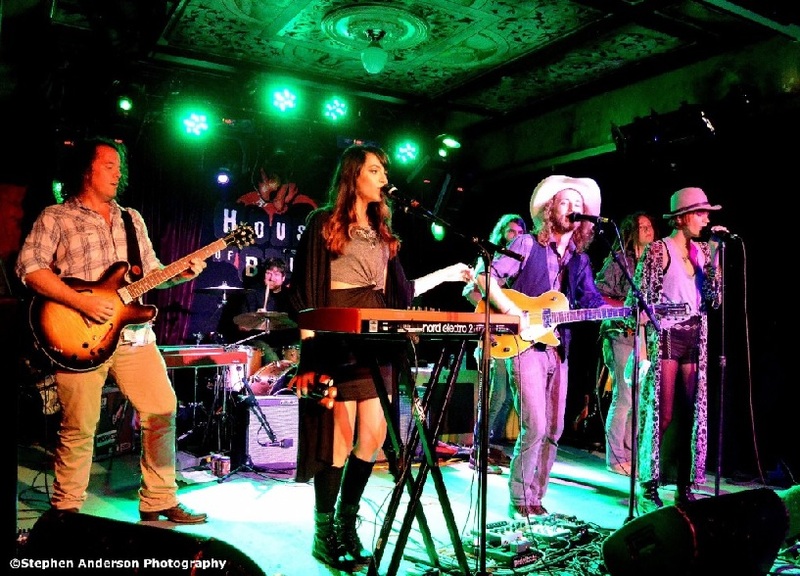 The two bands are longtime friends and have performed on many of the same stages, so it was fitting to see them do so in The Parish Room upstairs at The House of Blues. Rosco Bandana consist of Jason Sanford (guitar/vocals), Emily Sholes (keyboards/vocals), Jenny Flint (percussion/vocals), Jackson Weldon (mandolin), Josh Smith (bass), Patrick Mooney (guitar/pedal steel) and latest addition Patrick McGinley on drums who, convincingly, is one of the best along the Gulf Coast. 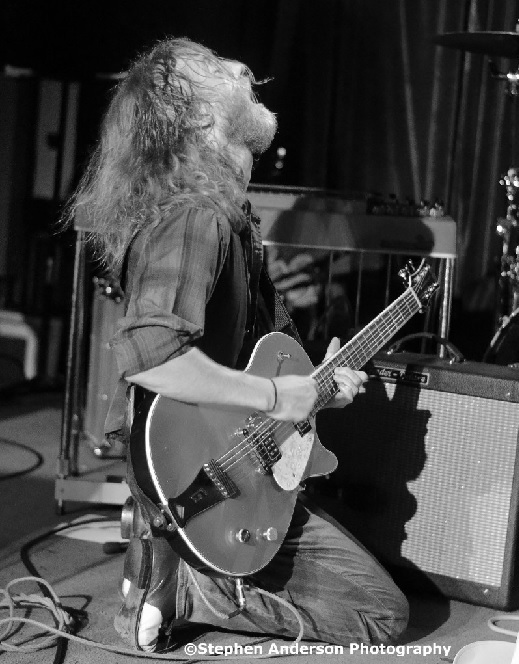 CLICK HERE TO CHECK OUT MORE PHOTOS OF ROSCO BANDANA AT THIS AND OTHER CONCERTS! Kaboom from the Mississippi Gulf Coast at the New Orleans’ House of Blues- Left to Right: Scott Erickson, Dustin Kahlil, Scott Andersen and Ben Kaufman) Photo by Stephen Anderson. “Giorgio Moroder -MEETS- the 1970s CBGB sounds of Blondie & Talking Heads -MEETS- the New York City Dance Life Scene of Studio 54 -MEETS-the literary works of H.G. Wells and Jules Verne”……Maybe better put: IT’S LIKE AS IF ‘DOCTOR WHO’ WAS A GREAT ROCK MUSICIAN”. That was first said nearly a year ago; since then they have evolved and have pressed forward into a fresh new approach visually and musically, leaving behind the Steampunk imagery of their past. They are LESS DR. WHO or H.G. Wells and more the band they are artistically becoming. As with anything, it’s a work in progress and they’re achieving it one step at a time. 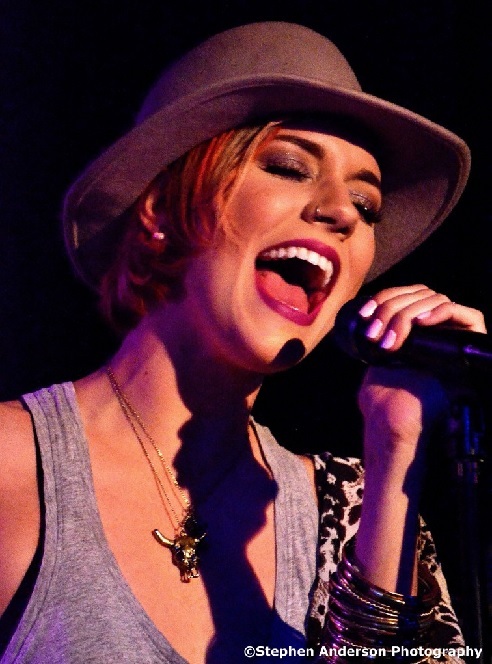 The songs are exceptionally right for radio airplay and right for the time. Deeply influenced by late 70’s New York City Pop & Rock, they definitely bring a freshness to the Pop Music World. I’ve spent much of my life following many of those New York City bands from CBGB and other venues across Lower Manhattan, and now I see some of what was present with those bands in Kaboom. 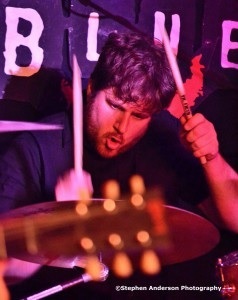 – Plus a bonus attraction -How many bands perform with their own pair of back up dancers? One could call them the Kaboom Girls or 2014’s version of The Solid Gold Dancers. A throwback of the Eighties, it’s different and fits in with what Kaboom is obviously wanting to achieve. Some times Pop is given a bad rap, case in point….. Blondie’s “Heart of Glass” was once shamed for being too Pop and Disco by CBGB regulars, but it is one of the greatest hits from that era. Who cares what genre it fits under. I believe Kaboom doesn’t either and I can’t wait to see what’s next. For goodness sake, get these guys on the radio, satellite, and/or local. The same goes for Rosco Bandana. As pictured above: Kaboom is Dustin Kahlil (guitar/synth/vocals), Ben Kaufman (bass/vocal), Scott Andersen (drums/vocals) and newly added to the band, Scott Erickson (guitar, banjo). CLICK HERE TO CHECK OUT MORE PHOTOS OF KABOOM! AT THIS AND OTHER CONCERTS! 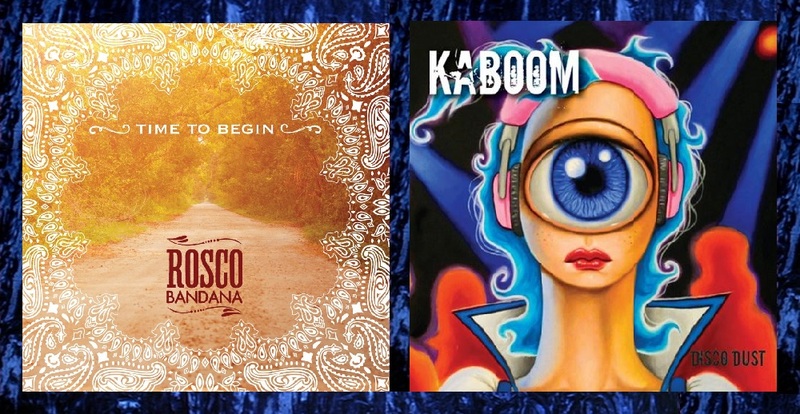 The debut full-length albums from both Rosco Bandana and Kaboom. Following article, see how you can obtain a copy of these two releases for yourself. Two Bands Deliver The Goods! 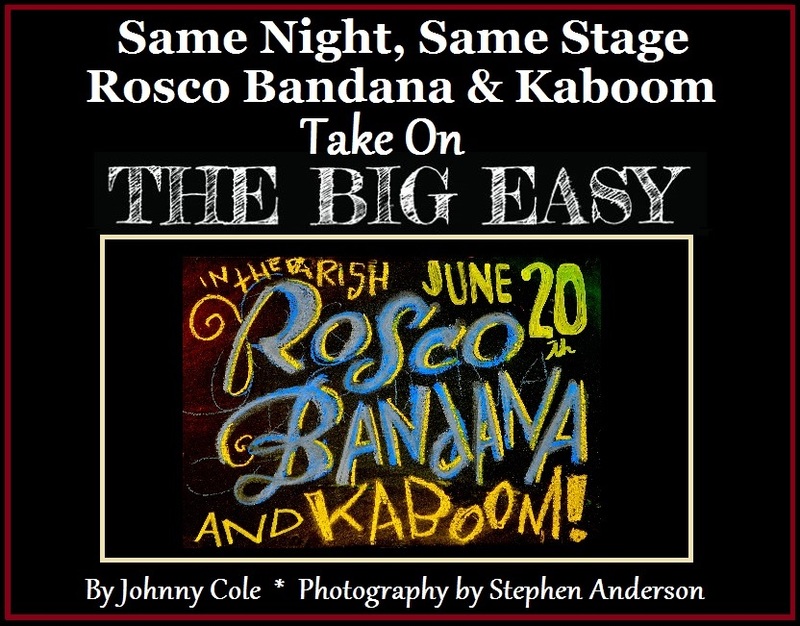 The most telling thing about the Rosco Bandana and Kaboom shows at The Parish Room was the audience. The bands were there to entertain and from viewing those in attendance – all signs point to their getting exactly what they wanted. The Line has seen both these bands on numerous occasions. We follow them closely and are glad to see them continue their journey and wish them all the best. Watching musicians reach new heights, especially in creativity, reigns supreme. We want to thank The House of Blues and Live Nation for their generosity and kindness towards The Southland Music Line. 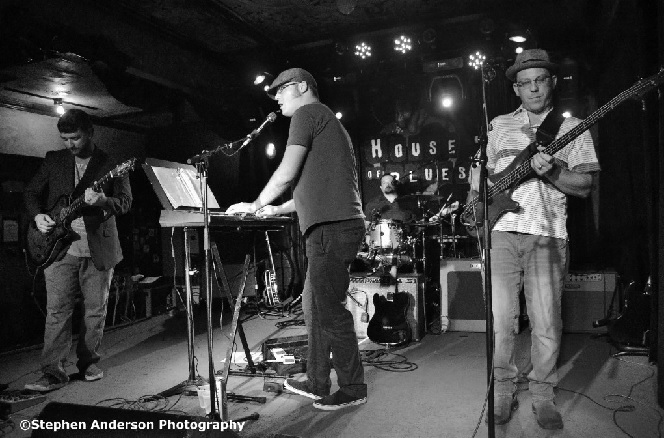 The House of Blues is one of the most accommodating venues we have the privilege of being associated with in covering a story and photographing a band or an event. Thank you! ALSO, IF YOU LIKE THIS ARTICLE WE WOULD APPRECIATE YOU CLICKING LIKE AT OUR FACEBOOK PAGE AND FOLLOWING US ON TWITTER. Tagged Jason Sanford, Kaboom, New Orleans, Rosco Bandana, The House of Blues, The Mississipi Gulf Coast Music Scene. You got it done this time Johnny Cole…these young artists have a friend in you and hope they know it.